W-E-L-C-O-M-E back my lovelies today I have another interesting post for you but before I get into this one, I just want to say ‘thank you’ for the amazing love and support on my last post, I think this post has been such a success, it has definitely convinced me to stay confident in what I’m doing and keep on going, so thank you guys 🙂 and if you haven’t seen it yet you can Check it out here. On to today’s post which is just as good; it’s all about makeup brushes 🙂 yay now you’re probably wondering why I’m so excited about these brushes and I also know most of you probably own top of the line brush sets but why do all “good things have to be so expensive” I mean what ‘if’ you don’t have that much to spend , I just like to save me some money if I can If you’re also looking for some good brushes or just want to start out with less inexpensive ones you’ve found your match I highly recommend that you try these I’m sure you’ll love these. Chances are you’ve most likely seen these brushes before cause they are very popular on Amazon and there are countless reviews on these as well, so why did I choose to write one… there’s only one reason for my reviews; I use it, I love it, so I share it. These are Makeup Brushes BESTOPE Premium Cosmetic Makeup Brush Set Synthetic Kabuki Makeup Foundation Eyeliner Blush Contour Brushes for Powder Cream Concealer Brush Kit(8PCs, Rose Gold) from Bestope®, the set includes eight brushes and a black bag for only $8.99 (reduced price), the packaging is straight forward; nothing special, though all brushes are individually packed in clear plastic and the black bag is also placed inside with the brushes in the clear plastic wrap. 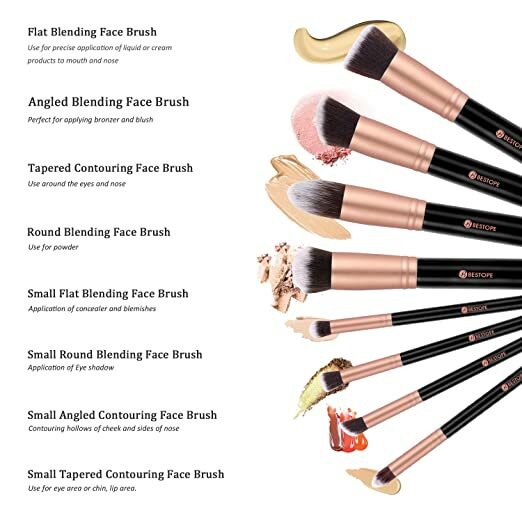 Flat Blending Face Brush is ideal for precise application of liquid or cream products. Angled Blending Face Brush is perfect for foundation, bronzer and blush. Round Blending Face Brush flawlessly applies powder, foundation, eyeshadow, and primer in high definition. Tapered Contouring Face Brush is for precise application around the face such as the eyes and nose. Our brushes are made of high-quality performance alloy, wood material, and a soft synthetic, offering a sense of luxury. Four different types brushes(Angled, Round, Flat,Tapered) provide easy and professional solutions for basic cosmetics foundation. The BESTOPE Premium Makeup Brush Set includes a 12-month worry-free warranty! These look great! I’ll have to try them! You’re welcome! Please continue sharing good content! 🙂 I love your beauty blog! I’ll definitely have to get these!! This was a great post & love your photography of them!! Loving this post, I never have any money left over to buy brushes after splurging on makeup 😂 These look amazing for such a low price I have to try them out!